Revolution Slider Error: Slider with alias case_greenpoint not found. Greenpoint tailors luxury with Autodesk PLM 360 integration. Creating a remarkable aircraft interior requires careful design that meets strict FAA regulations. In seeking a better way to design and manufacture its luxury interiors in line with high client expectations and rigorous safety standards, Greenpoint decided to adopt Autodesk PLM 360 to manage the complete product lifecycle. But the company knew that PLM 360 alone wouldn’t be enough to power the precision engineering process it needed. Without integration, Autodesk wouldn’t be sufficient. “It would manage the process, but key outcomes wouldn’t be managed alongside it,” according to Michael Pares, Systems Development Manager at Greenpoint. 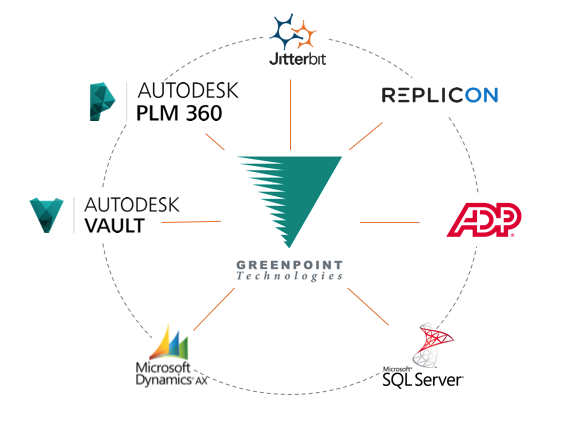 Greenpoint selected Jitterbit as an integration provider based on Autodesk’s recommendation. Jitterbit and Autodesk can be tightly integrated to enable effective automatic management of workflow approvals and other important steps in the product lifecycle. It took just a few weeks to implement the integration, which set Greenpoint up for a successful experience with Autodesk. Every Greenpoint project requires a significant amount of upfront planning. Engineers have numerous meetings to define the design for different sections of the plane, as well as identify the components needed to actually build the design. This planning process can involve the creation of hundreds or even thousands of engineering drawings. Once the plans are drawn, Greenpoint uses Jitterbit to automatically load the numerous drawings into the Autodesk system and kick off a sophisticated workflow that manages the entire design approval process. As the drawings are loaded, Jitterbit triggers a PLM script to create a corresponding task for each drawing. As a task moves through its predetermined workflow, Jitterbit does everything from create the required CAD files to change file permissions to make sure only people at appropriate levels can access and approve them. Jitterbit keeps the design review process on track, automatically. After the files are reviewed and approved, the project enters the planning and procurement stage, which assembles all the parts required to actually build the interior. Occasionally, a problem arises in the procurement process. For example, maybe a part that’s required by a drawing isn’t available, or a measurement was slightly off. If that happens, Jitterbit also automates the process of revising plans and obtaining new approvals so that the interior will be perfect. Greenpoint uses Jitterbit to not only guide its planning process, but also report on it in detail across the organization. Jitterbit pulls data from all of Greenpoint’s Autodesk PLM 360 workspaces every night and sends the information to Microsoft SQL Server to create custom reports on how the design process is going. These reports can also pull in information from other systems, like Microsoft Dynamics AX, when needed. Based on this process, all employees get a weekly report card with the number of tasks they have assigned to them, including details like how many tasks are on track or overdue. These reports go to employees and their managers, so everyone’s aligned on project status – all the way up to the CEO. This helps management quickly identify and resolve any small issues before they become big problems. While it’s difficult to quantify the value of making sure business runs smoothly, Greenpoint has calculated the costs of projects falling behind schedule, which can be substantial. By automating workflow processes, Jitterbit prevents costly delays and keeps Greenpoint moving forward. Without Jitterbit, engineers would have to spend more of their time and energy manually checking on project and task status, slowing down the process and inviting errors. Jitterbit has also become deeply integrated into the way that engineering works at Greenpoint, enabling the company to “think bigger” about building new initiatives. Rather than feeling limited by infrastructure, Greenpoint engineers have a way to easily build the processes they need to be successful. Greenpoint recently upgraded from Jitterbit 5 to the new Harmony Live platform, which provides improved speed, security, and API connectivity. The transition to Harmony was almost too successful – the new platform was so fast that it began to return errors because the systems it was contacting hadn’t updated yet. Greenpoint built in slight delays into the process to ensure that other systems had time to update and respond properly to Harmony’s fast requests. Ultimately, Jitterbit has provided an invaluable integration and automation tool for Greenpoint. Design and approval processes work seamlessly, even the smallest issues are automatically surfaced and quickly resolved, and the entire company gains improved visibility into how everything is working. And, of course, customers get their amazing interiors – delivered on-time and perfectly designed, down to the last stitch.